Imagine walking down the aisle to the beautiful sounds of flutes in perfect harmony. Pure Silver Flutes are a classy alternative to a string quartet, harpist or band, and are sure to make your big day memorable. We allow you to choose the number of musicians, catering for intimate garden weddings, large cathedral masses and everything in between. 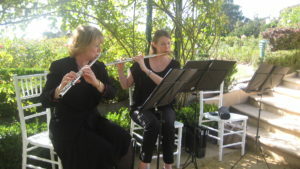 The beauty of the classics or a favourite melo dy — Pure Silver Flutes can adapt most styles of music to create distinct and personalised music to suit your wedding. Don’t be restricted to one style of music! Pure Silver Flutes plays everything from classical to rock. Recent requests have been as diverse as John Legend’s ‘All of Me’, Christina Perri’s ‘A Thousand Years’, The Wedding theme from “Twilight”, Green Day, Michael Buble and the classics of Bach and Mozart. Unlike many other music groups, Pure Silver Flutes are all professional musicians with extensive experience in wedding performance. You can relax in the knowledge that our musicians will arrive early, be elegantly dressed and provide unobtrusive ambience with perfect timing. We will help you create a musical soundtrack for your wedding that truly represents you. You can request pieces to celebrate your special moments or we can help you choose the music to commemorate your event. We can supply you with lists of recommended repertoire which suit each part of the ceremony or we can create a complete and individualised programme for your function if preferred. Please note: there is a minimum booking of 1.25 hours for weddings and packages start at $450.00 (Duo for 1.25 hours).